Singularity theory stands at a cross-road of mathematics, a meeting point where manyareasofmathematicscometogether,suchasgeometry,topologyandalgebra, analysis,di?erential equations and dynamical systems, combinatoricsand number theory, to mention some of them. Thus, one who would write a book about this fascinatingtopicnecessarilyfacesthechallengeofhavingtochoosewhattoinclude and,mostdi?cult,whatnottoinclude. Acomprehensivetreatmentofsingularities would have to consist of a collection of books, which would be beyond our present scope. Hence this work does not pretend to be comprehensive of the subject, neither is it a text book with a systematic approachto singularitytheory asa core idea. 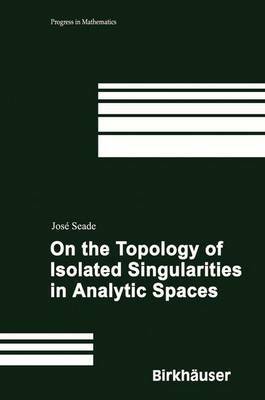 Thisisrather a collectionof essaysonselected topicsaboutthe topologyand geometry of real and complex analytic spaces around their isolated singularities. I have worked in the area of singularities since the late 1970s, and during this time have had the good fortune of encountering many gems of mathematics concerningthetopologyofsingularitiesandrelatedtopics,masterpiecescreatedby greatmathematicians like Riemann, Klein and Poincar' e,then Milnor, Hirzebruch, Thom, Mumford, Brieskorn, Atiyah, Arnold, Wall, LeDung " Tran ' g, Neumann, Looijenga, Teissier, and many more whose names I cannot include since the list would be too long and, even that, I would leave aside important names. My own research has always stood on the shoulders of all of them. In taking this broad approach I realize how di?cult it is to present an overall picture of the myriad of outstanding contributions in this area of mathematics during the last century, since they are scattered in very many books and research articles.